Fashion is dictatorial, modernity is liberating. Freedom of spirit encourages a new way of thinking. The driving forces behind Silver are enjoyment and the curiosity to achieve a new aesthetic from and function. 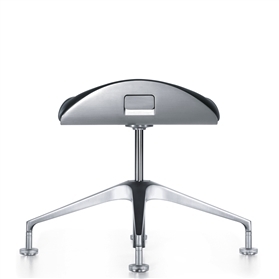 Product design: Hadi Teherani AG Silver-chair was designed by Hadi Teherani with Ulrich Nether, Hans-Ullrich Bitsch and the project manager Sören Jungclaus. reddot design award winner 2003 . reddot design award winner 2007 . best selection office design 2003 . if product design award winner 2005 . AIT Innovationspreis 2004 . Neocon gold award 2005 . Neocon silver award 2007 . Nominated for the Design Award of the Federal Republic of Germany 2006 and 2008 . 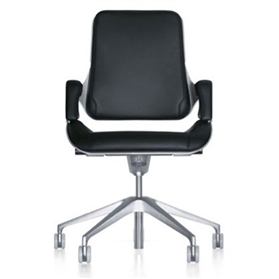 Design award Baden-Württemberg gold medal BIURO 2007 Poznan Office swivel executive chair, Medium backrest, synchronous mechanism. 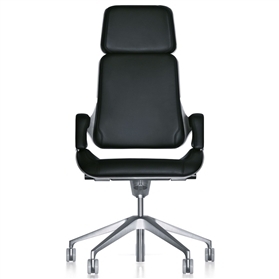 THE SILVER CHAIR IS USED BY SIR ALAN SUGAR IN THE APPRENTICE TV PROGRAM. Warranty: 5 Years A very special hand made chair. See technical detail images to the left.